If you’re a fan of caramelized onions, here’s a dish for you. Mujadara is a rice and lentil dish that’s heavily flavored with onions. We love how sweet the onions turn after slowly browning. The rice and lentils are cooked with vegetable broth, garlic, more onions, allspice, cumin, and cinnamon. It’s a very fragrant dish that makes the kitchen smell wonderful. 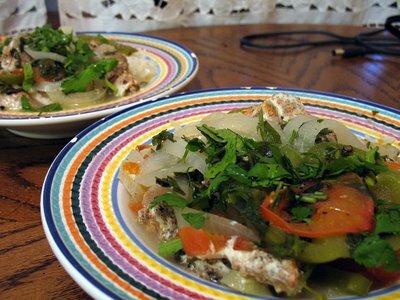 Top it with a dollop of yogurt and some chopped mint, along with a side of cucumbers and tomatoes. 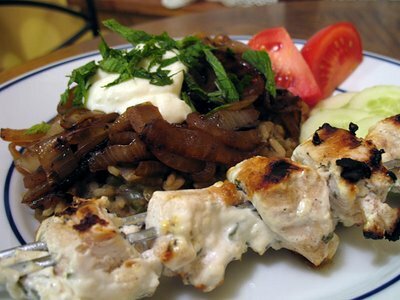 Tonight we served it with some chicken skewers that had been marinating in yogurt, feta, fresh rosemary, and oregano. Divine! Both recipes came from RecipeZaar — the mujadara recipe can be found here, and the marinade here. Yep, Great Bowls of Fire again. 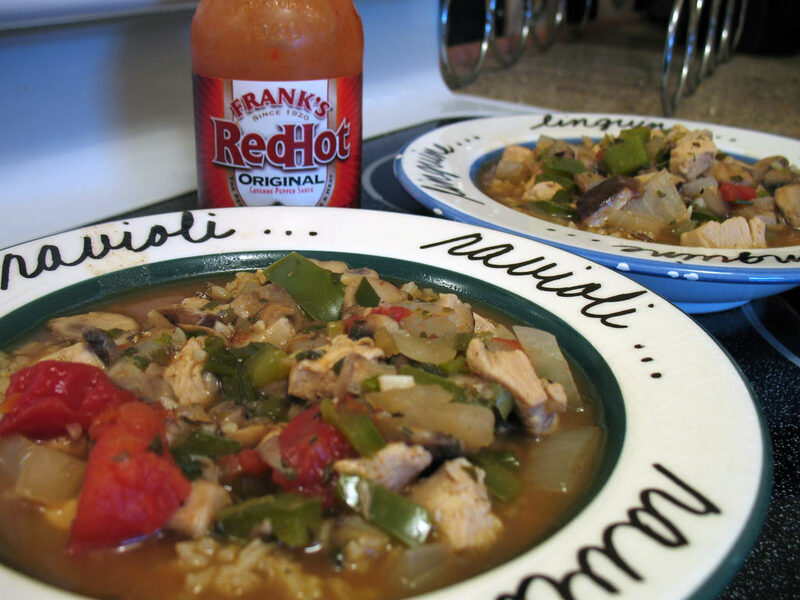 This gumbo with non-traditional ingredients — mushrooms? and where’s the okra? — is one of Lisa’s favorites to make. The best part about many of these meals is that the flavors intensify over time and they can be even better as lunch the next day. From perennial favorite Great Bowls of Fire comes this delicious stew of pork, hominy, and tomatillos. 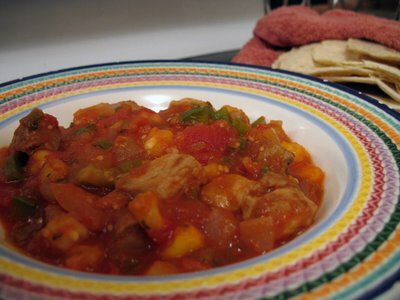 The book includes two or three other recipes for posole, but the inclusion of tomatillos in this one gives it a uniquely tart taste throughout. 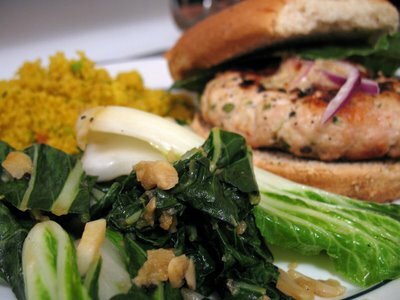 Nothing super fancy tonight — turkey burgers on the grill — but Lisa found a nice recipe for stir fried bok choy with garlic and ginger as a side dish. Unsurprisingly, she quadrupled the garlic. We’re vampire-safe for the time being.